When it comes to locs and hair care one of the most common questions is “what should I put on my hair and scalp for [insert concern]?”. Well, I’m glad you asked. Your hair products are just as important as the food you put into your body because they feed your hair. 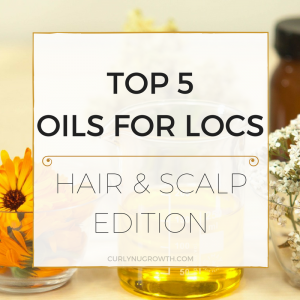 So, let’s talk about the top 5 oils for locs as they relate to hair and scalp treatments. When you have dry locs, a Hot Oil Treatment is great way to help them retain moisture. When performing a hot oil treatment I absolutely love using the Lite Hair Oil by Nuade. This oil is packed with nutrients, smells great and leaves the hair feeling conditioned. If your locs are thinning at the roots or if you’re experiencing hair loss, first it is important to identify the cause(s) of the thinning. After the thinning has been identified, if you’re looking for an oil to apply what will promote hair growth, I recommend the Mane Abundance Hair Growth Oil— NOT Jamaican black castor oil. From personal experience, I can attest to the effectiveness of the Mane Abundance oil AND the benefit of it not clogging the hair follicles like jamaican black castor oil. If you’re experiencing itchy scalp, first it is important that you understand why your scalp may be itching (dryness, scalp condition, sweat, etc.) so that you know how to best treat it. After the cause has been identified, I prefer to use the Chill Noggin Oil. The ingredients in Chill Noggin oil are very effective at soothing the scalp and relieving itchiness. Also, consider incorporating more steam treatments into your regimen. There are several factors that can contribute to dull locs; one of which is too much product buildup. After a thorough Detox Treatment on your locs, and to help prevent any additional buildup I recommend using the Mane Radiance Oil by NuGrowth Essentials. The Mane Radiance oil is light enough for everyday usage without causing buildup, and rich enough to keep the locs feeling nourished with an immaculate shine. I love using the Mane Radiance Oil because you see immediate results and the scalp can breathe. Oil for a Normal Scalp. When your locs are properly hydrated and healthy, it is important to maintain that state. One way to maintain healthy hair is by not suffocating it product, which is why I like using the Yaya Oil by Dr.Locs. The Yaya Oil is really lightweight and helps to maintain the fresh clean feeling of your locs and scalp! I do understand that not everyone can use oils that are formulated by brands. Maybe you’re allergic to a specific ingredient, can’t afford it, or just prefer to make your own oils. I am a huge advocate for creating customized blends of botanical oils to specifically address hair and scalp care needs. However, not all plant oils and essential oils should be used on locs because of the potential product and lint buildup. Did you know lint is attracted to heavier oils?! 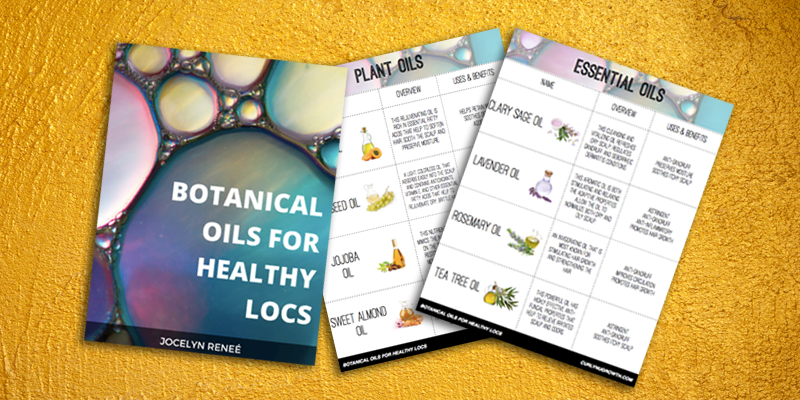 If you’re interested in learning which specific oils benefit locs, you should grab the “Botanical Oils for Healthy Locs” guide! In the comments, share which oils or blends you like using in your locs? What’s the best hair dye to use to achieve a burgundy color on sandy brown hair without damaging locks? You should go see a professional that specializes in color, and particularly on locs. Any at-home (box) hair color will cause damage to locs. I have just started this journey. My locks are 1 week old. I am so excited that I found your website. I have read lots of great information and look forward to more. Congratulations on your new journey and thank you so much again for joining the NuGrowth Community! I love coconut oil for my locs!! I’m glad its working for you, but be careful of coconut oil…it solidifies and contains protein. I workout alot…. What to do for when your dreads get musty-like? I don’t wanna over-wash them…is there a nice smelling oil or something I can use to keep my head fresh-smelling in between washings. I came across your site researching how to grow thick locs. Love it! I restarted my journey yesterday. I’ll definitely be taking a lot of your advise. THANK YOU SO MUCH!! Congratulations on your new journey with thick locs!